SlideShare, the “YouTube for presentations,” has been making a big push to become the go-to platform for professional and business content. Last year, the startup unveiled two premium services for businesses, LeadShare and AdShare. And earlier this year, SlideShare launched another business-friendly product, branded channels. Today, the startup is going multimedia by allowing users to upload and share business videos. SlideShare lets anyone share presentations and also serves as a social discovery platform for users to find relevant content and connect with other members who share similar interests. On SlideShare now, professionals can now upload and share videos of their talks, promotional videos, screencasts, demos and webinars. At the moment, users are restricted to only five videos per month (with no limit to length of videos). Videos on the site have same functionality as the slides and presentations, with the ability to share on Twitter and Facebook and embed on sites and blogs. Professionals can also use the SlideShare app on LinkedIn for sharing videos with their professional networks. 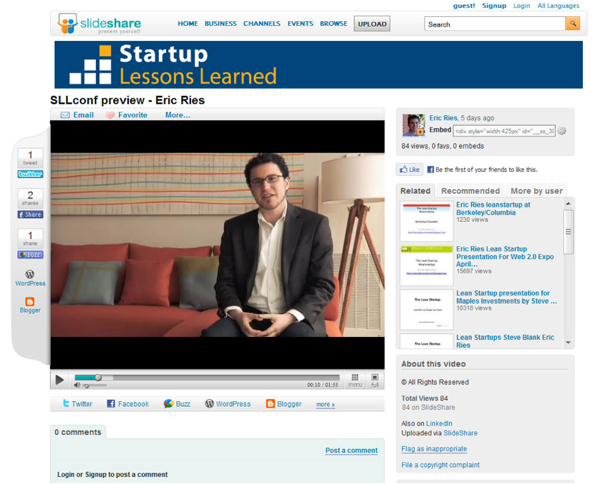 In terms of monetization, SlideShare video owners can integrate the LeadShare model that the startup launched last year. Currently, all videos will be ad-free but co-founder and CEO Rashmi Sinha says that the startup is still testing the business model for now. Sinha says that SlideShare is not trying to compete with popular video sharing sites like YouTube or Vimeo and is limiting its focus on pure business content. Competitor DocStoc is also trying to make a push towards business and professional content as well.